In one week, I’ll go from being a full-time teacher to teaching half-time. That way, more time opens up to devote to my family and my freelance career! As a result of the kids corner we’re planning to create in the living room, I’m currently busy setting up my workspace somewhere else. With the computer already in place, the next item on my list was creating some shelving for all of my artbooks! First I had the idea of stacking different sizes of crates together to create an organic bookcase. While I was busy gathering inspirations on Pinterest, I came across an interesting Ikea hack. Because I really like those DYI (do-it-yourself) projects, I decided to go for Ikea hack instead. After all, I wasn’t really feeling the idea of the crates and the hack was more aimed towards the style I like in furniture as well. 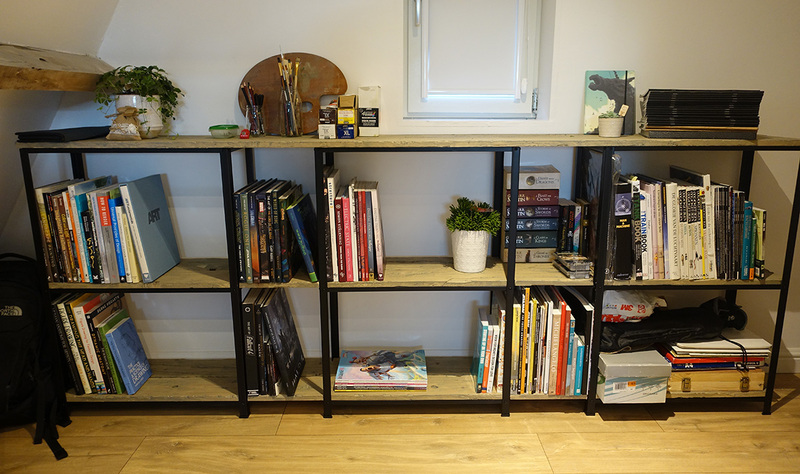 The DYI project lets you be creative with the basic Hyllis IKEA shelf unit. It comes down to cutting it to the desired height, dying it in your favourite color and add wooden boards on top of it. I took the hack a bit further and added more wear and tear to the wooden boards by beating and cutting in it. I also treated the boards with a grey teak oil to give it a more rural look. It was interesting to create these ‘textured’ wooden boards in real life. Normally that is something I would paint in a texture or model it in the 3d model. If you’re interested in trying out the Ikea hack yourself, you can find a step by step description on this blog. Finishing my pinboard to put my references for the top-secret projects I’m working on : -)! Decorating the workspace with some more plants. Find out why plants are beneficial to have in a working environment! If you have any ideas to decorate my workspace further or, maybe you want to show how your own workspace looks like, please let me know! I’m interested in finding out!